First Line: Brittany Morgan knew she was a good mother, no matter what other people said. Teenage Brittany's baby was finally asleep, and since she was only going into the grocery store for a few minutes, she cracked the window, locked all the car doors, and ran inside for the things she needed. When she got back, her baby was gone. The only thing Brittany can remember is the white van with a strange logo on it that was parked next to her car-- and then gone when she came out of the store. The van belongs to the Talking Hands Ranch and was driven by Dr. Grace McKenna. Grace didn't see the kidnapping, but her passenger did. Her passenger? A gorilla named Neema. Neema has the attention span of a five-year-old, and she knows sign language. But when Grace finally pieces together what the gorilla saw that upset her so much, is she going to be able to make the police believe Neema's eyewitness testimony? 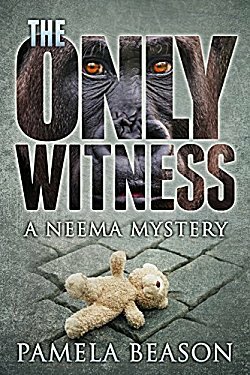 The idea of having a gorilla be the only witness to a crime intrigued me right from the beginning, and Pamela Beason's fast-paced mystery ticks all the boxes. The mystery is first-rate, and the work Grace McKenna does with Neema's language skills is fascinating. Readers also learn the difficulties such programs have in getting funding-- and their acceptance (or lack thereof) when located in small, conservative communities. The characters are very well drawn. Brittany isn't your typical teenage mother. Beason portrays her empathetically, showing us a young girl who is naive but who also shows surprising depth. Matt Finn, the detective in charge of investigating the kidnapping is tired and depressed, dealing with his own personal problems, and it's interesting to see how the case starts bringing him back to life. And as for Grace and Neema? It's mainly due to these two characters that I'm glad to see that there's another book in the series to read. Are you an animal lover who likes a good, well-paced mystery with strong characters? I highly recommend Pamela Beason's Neema mysteries. Granted, it's not an idea that would be strong enough to carry a lengthy series, but one or two books? Really good stuff! Oh this is interesting. I think I own at least one book by this author, but not about a gorilla. Maybe a cougar or bear or something. Need to go look. I have one book group member who is crazy about animals. Will have to suggest this author to her. I really like Beason's mysteries, and I think you're talking about one of her Summer Westins which I'm particularly fond of. Your book group member should enjoy this Neema mystery.